As a work-at-home mom for more than three years, I can promise you that no babies were harmed in the making of this film. 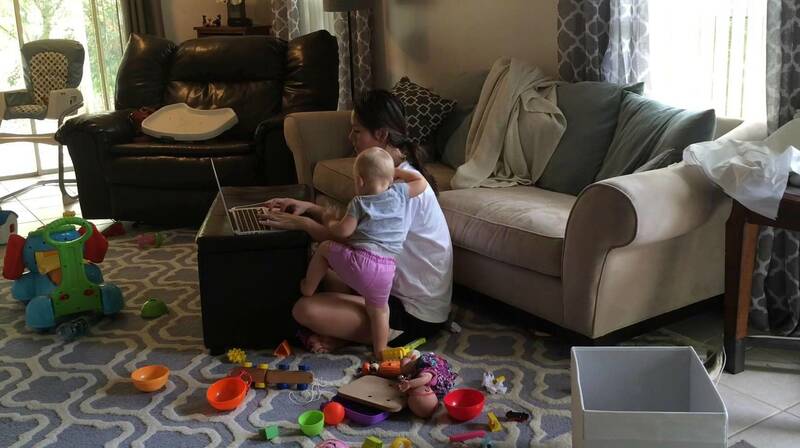 I can also promise you that viral mom blogger Esther Anderson gets everything right as she captures how difficult it is to get any work done at home with a busy toddler running underfoot. If you’re not familiar with 29-year-old Anderson, she’s the creator of the Story Of This Life blog and the genius behind the viral video “Why Moms Get Nothing Done.” The video is so simple, so sweet and so frighteningly accurate. No wonder every mom on Facebook shared it with abandon. Someone finally gets us! As a first-time mom to Ellia, Anderson — along with her husband Thad — has made it her mission to “tell you how it is” by capturing life’s most mundane yet most frustrating parenting moments. Anderson’s next adorable video starring her cute toddler Ellia is about the plight of the working mom. In “When Toddlers Interrupt,” we see Anderson try to perform a totally innocent task — what appears to be answering an email. In just over a minute, it’s clear that’s not gonna happen. Young Ellia bounces all over the room, writhes on her mom’s lap and eventually tries to run away. As the mom of two toddler boys, I know this is par for the course. This video is 100 percent accurate. It is literally impossible for me to get any work done as a work-at-home mom, unless I tag my husband in or cram in all the work I can while my kids are at morning day care. This down-to-earth attitude is what makes Anderson’s candid videos so popular. Every mom has been there before. Every mom of young children understands what it’s like to want to pull out your hair one minute and cuddle your kids the next. As Anderson proves on behalf of work-at-home moms everywhere, if you have a toddler in the house, don’t even bother trying to get any work done.